Very nice, very stylish. Lightweight and practical. 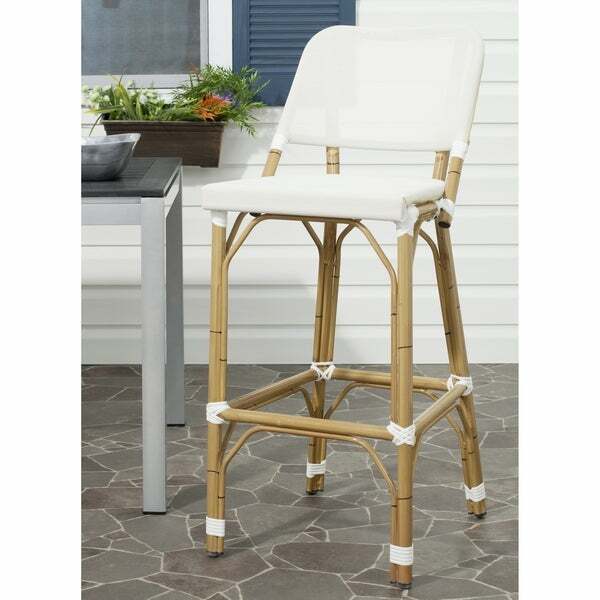 Safavieh Deltana Brown 30-inch Bar Stool - 17" x 20" x 41.3"
Designed with casual tropical vibe, the white Deltana indoor outdoor barstool by Safavieh is styled with classic wrapped detailing on its faux bamboo frame. Crafted of PE wicker and aluminum, this transitional barstool is easy care, weather resistant and equally pretty at a kitchen or patio counter. Dimensions 41.3 in. H. x 17 in. W. x 20 in D.
These chairs made a perfect addition to our recently built grill island. They are light in weight but strong and made for outdoor use. Love the bamboo look without needing to worry about the cracking and discoloration that you get with bamboo. The colors were right one with my patio. Great price as well with Overstock. I had trouble finding chairs in white that weren't too super modern looking. This chair is comfortable, sturdy, and looks great. Using it at the kitchen counter which goes into the living-room. The white does the trick with our decor. These chairs are sturdy and well made. They go perfectly with our new patio decor. The seats are very comfortable and easy to clean. Will soon be purchasing more for our kitchen island. Would recommend this chair. These are sturdy, stylish and really nicely made..and light weight-so easy to move around!! I love the glossy finish -- it makes these stools feel very neat and clean. After scouring the internet and looking at hundreds of bar stools, I found these and ordered 2. We like them so much we ordered 2 more to finish out the set for our indoor bar. You can't beat this price and they look fantastic. Great personality. These are soooo perfect! The mesh seat and back are very comfy and the design is beautiful. They are indoor outdoor which I love for function especially when we are putting them at a beach house where people take them in and out on the porch or keep them inside. Would order them again for sure! I would recommend these highly...Super light weight yet incredibly sturdy. We have had them for two years now and they look brand new. Beautiful bar stool! Love the look and the price is exceptional. Chairs have been fantastic. Easy to clean with little kids. I ordered two of these chairs for my pub table on my deck. I love them. Very sturdy and well made. They are comfortable to sit in. These chairs will last. Not bad for the price if you want a plastic stool for outside. Seat is comfortable. I was looking for a real wood stool which is why the low rating. "It says the seat height his 29.5. That would be too high for a counter. Is this accurate? Your legs could not fit underneath." These stools have good rating for the cost. I hope they live up to description. "Does this come in counter height?" We do not offer this stool in a counter height option. "What fabric is the seat made of?" Hello walkitpat, the seat is made from polyester wicker. Thank you for shopping with us and have a great day. Safavieh 43.3-inch Minerva Wicker Natural Brown Wash Bar Stool - 18.1" x 20.9" x 43.3"